M. P. Evans was born in 1826. He married Ebaline Wilson, daughter of John Thomas Wilson and Katherine Ann Moore, on 30 April 1865 at Butler, Bates, Missouri. Michael Ramfield was born in 1827. He married Ebaline Wilson, daughter of John Thomas Wilson and Katherine Ann Moore, on 19 December 1866 at Butler, Bates, Missouri. Michael Ramfield died in 1881. Henry Boyer married Mary Gambell. Henry Boyer was born in 1775 at Pennsylvania. He died on 17 August 1861 at Johnson, Arkansas. Mary Gambell married Henry Boyer. Mary Gambell was born in 1778 at Tennessee. Katherine Cahill was the daughter of Thomas Cahill and Bridget Walsh. James Cahill was the son of Thomas Cahill and Bridget Walsh. Thomas Cahill was the son of Thomas Cahill and Bridget Walsh. Married Name 29 April 1908 As of 29 April 1908,her married name was Hood. Mabel Colmia Dolan was born on 20 June 1888 at Webster, Iowa. Mabel Colmia Dolan married Albert Francis Hood on 29 April 1908. Mabel Colmia Dolan died on 9 December 1922 at Webster, Iowa, at age 34. Albert Francis Hood was born on 26 August 1888 at Iowa. He married Mabel Colmia Dolan, daughter of Thomas F. Dolan and Bridget Friel, on 29 April 1908. Albert Francis Hood died on 28 March 1932 at Iowa at age 43. Thomas Arthur Dolan was born on 13 April 1893 at Iowa. Thomas Arthur Dolan died after 1940. Loretta Dolan was born in April 1894 at Iowa. Married Name 7 August 1859 As of 7 August 1859,her married name was Williams. Levine Boyer was born in 1828 at Tennessee. She was the daughter of Henry Boyer and Mary Gambell. Levine Boyer married Allen Williams on 7 August 1859 at Arkansas. Levine Boyer died on 7 August 1891 at Kentucky. Allen Williams was born circa 1828 at Kentucky. He married Levine Boyer, daughter of Henry Boyer and Mary Gambell, on 7 August 1859 at Arkansas. Allen Williams died in 1905 at Arkansas. Name Variation (?) Wolfe was also known as (?) Wolf. (?) Wolfe married Elizabeth L. Pancake before 1849. John Buckley was born circa 1809. He married Elizabeth L. Pancake on 30 September 1849. John Buckley died in 1860. Henry Buckley was born in 1799 at Bedford, Bedford, Virginia. He was the son of John Buckley and Rebecca Huddleston. Henry Buckley married unknown (?) before 1820. Henry Buckley died after 1820 at Kanawha, West Virginia. Free White Persons - Females - 16 thru 25:1. Clyde Long married Elsie Plato. 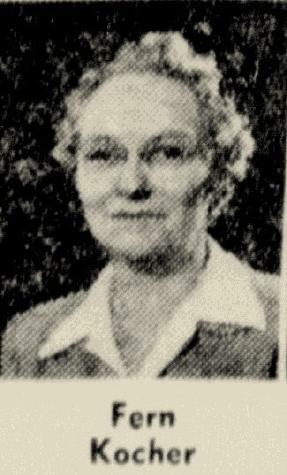 Elsie Plato married Clyde Long. Herbert Clay Jones was born circa 1895. He married Vada Pearl Cushard, daughter of Amos M. Cushard and Emma Ham, on 30 December 1919 at Warren, Ohio. Thomas Daniel Holland was born on 14 June 1885 at Kentucky. He married Vada Pearl Cushard, daughter of Amos M. Cushard and Emma Ham, before 1927. Thomas Daniel Holland died on 20 January 1954 at Kentucky at age 68. John William Cushard was born on 13 December 1914 at Fleming, Kentucky. He was the son of Vada Pearl Cushard. Abraham Conrad was born in January 1866 at Kentucky. He married Lucinda A. Cushard, daughter of Henry Cushard and Christina Mercer, circa 1890. Abraham Conrad died before 1944. Name Variation Leon Thine Minette was also known as Leon Minette Jr.
Leon Thine Minette was born on 23 February 1917 at Dane, Wisconsin. He was the son of Leon Edward Minette and Grace Elizabeth Kroll. Leon Thine Minette married Cleo Smith on 4 December 1937 at Dubuque, Iowa. 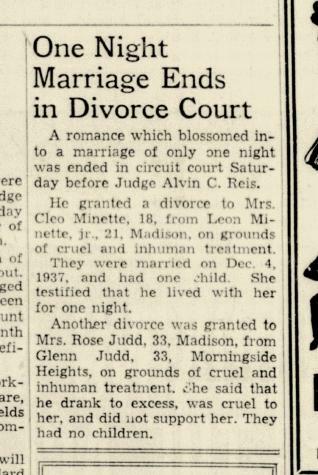 Leon Thine Minette and Cleo Smith were divorced in September 1938. Leon Thine Minette died on 19 April 1981 at Madison, Dane, Wisconsin, at age 64. [S243] U.S. Federal Census 1920 U.S. Federal Census, by Ancestry.com, Year: 1920; Census Place: Roxbury, Dane, Wisconsin; Roll: T625_1982; Page: 8B; Enumeration District: 76. Married Name 23 March 1928 As of 23 March 1928,her married name was Kocher. Fern R. Minette was born on 19 March 1905 at Dane, Wisconsin. She was the daughter of Leon Edward Minette and Grace Elizabeth Kroll. 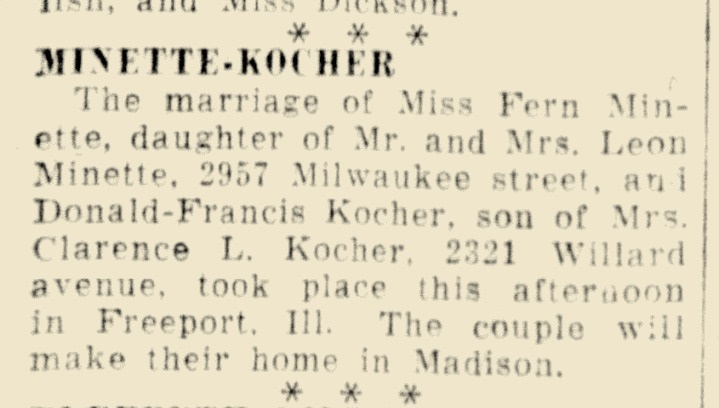 Fern R. Minette married Donald Francis Kocher, son of Clarence L. Kocher and Ada Bailey, on 23 March 1928 at Freeport, Illinois, Fern Minette and Donald Francis Kocher marriage announcement. Fern R. Minette died on 30 March 1997 at age 92. In November 1956 Fern (Minette) Kocher and Grace (Kroll) Minette employees of Ray-O-Vac. [S250] U.S. Federal Census 1930 U.S. Federal Census, by Ancestry.com, Year: 1930; Census Place: Madison, Dane, Wisconsin; Page: 7B; Enumeration District: 0042. Donald Francis Kocher was born on 16 January 1906 at Wisconsin. He was the son of Clarence L. Kocher and Ada Bailey. 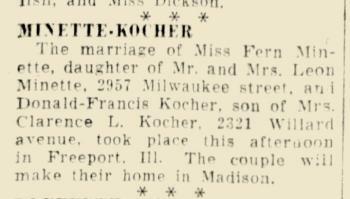 Donald Francis Kocher married Fern R. Minette, daughter of Leon Edward Minette and Grace Elizabeth Kroll, on 23 March 1928 at Freeport, Illinois, Fern Minette and Donald Francis Kocher marriage announcement. Donald Francis Kocher died on 12 July 1991 at Florida at age 85. Married Name 4 December 1937 As of 4 December 1937,her married name was Minette. Cleo Smith was born before 1920. She married Leon Thine Minette, son of Leon Edward Minette and Grace Elizabeth Kroll, on 4 December 1937 at Dubuque, Iowa. 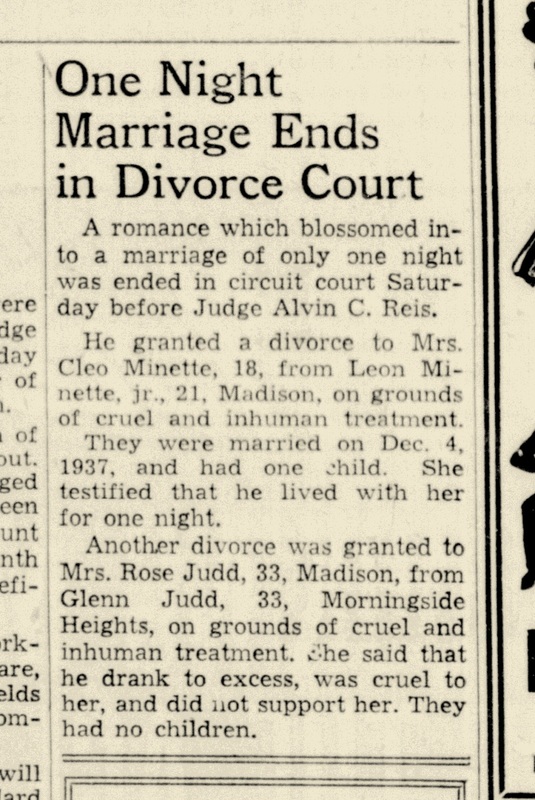 Cleo Smith and Leon Thine Minette were divorced in September 1938. Barton Oscar Groves was born on 7 August 1904 at Wisconsin. He married Edna J. Hemberger, daughter of Ferdinand Hemberger and Anna Margaret Hutter, on 8 June 1933 at Michigan. Barton Oscar Groves died on 19 March 1985 at Milwaukee, Wisconsin, at age 80. Henry Joseph Luther married Ruby Viola Hemberger, daughter of Ferdinand Hemberger and Anna Margaret Hutter. Henry Joseph Luther was born on 17 October 1890 at Sauk, Wisconsin. He died in April 1969 at age 78.